When you go shark cage diving in Cape Town or Gansbaai, it’s not only an exhilarating experience, but also an educational one. All too often we tend to view these majestic creatures as rows of razor sharp teeth and not much else, when in reality, they are complex animals that are sadly often misperceived. White shark diving in South Africa is important, predominantly because it assists in conserving the apex predators exposing people to them and correcting the ‘Jaws complex.’ This movie was extremely damaging to the sharks’ reputation, making them out to be ruthless killing machines, when in fact it is not programmed into their nature to recognise humans as prey. 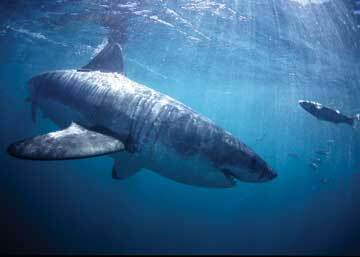 The shark attacks that do happen are mostly the result of the sharks’ curiosity â€“ they rarely bite, but when they do it’s generally to identify what you are. A shark’s skeleton is comprised of cartilage and connective tissue: cartilage is long-lasting and flexible, but most importantly, it is also approximately half the density of bone, thus, reducing the shark’s weight and conserving its energy resources. Sharks’ pectoral fins are not fused to their heads and they breathe through the five to seven gill slits located on the sides of their heads. Sharks constantly replace their teeth, which are not affixed to their jaws, but rather entrenched within their gums. The replacement teeth are located on the inside of the jaw, within a groove and they consistently shift forwards to replace the old teeth. It is estimated that sharks can lose more than 30,000 teeth in their lifetime. The shape of the shark’s tooth is largely determined by its prey â€“ if it feeds on crustaceans and molluscs, its teeth will be flattened and powerful, while if it feeds on fish, its teeth will be needle-like and pointed. Sharks that feed on mammals and large prey have triangular, serrated upper teeth and pointed lower teeth. Reinforced by ceratotrichia, which are soft filaments of elastic protein; the shark’s fin skeletons are elongated and their structure prevents the shark from moving in a tail-first direction. Supple collagenous fibres form a complicated dermal corset around the shark’s body, taking the form of a helical network and acting as an outer skeleton.